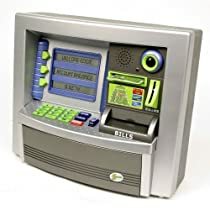 The Ultimate ATM machine-it’s just like the real thing. The LCD screens welcome you and will give you all of your up to date account information. This ATM is so advanced it even knows your name. The realistic camera and incredible sounds will make you think you just pulled in to the bank. SMASHING your piggy bank is a thing of the past with this ATM machine.Requires 3 “AA” batteries (included). Measures 12″ x 4″ x 10″.